Hey guys happy #MakeupMonday, fall season is here and I can't believe I am already bringing out my jacket :-( But nonetheless I am pretty pumped for fall fashion who else is? For this weeks makeup look I wanted to keep it still very fall inspired, but I found the only dark lippy I own is Mac's smoked purple which I already used in this post here, so I need to invest in more lippies. But I still think this looks very fall ishh...innit? All details of everything used will be at the end as well as a youtube tutorial which is now up so click below to check it out. 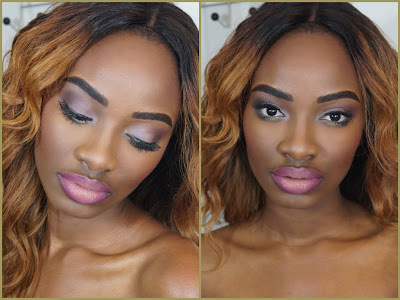 For this look I used my estee lauder pallete and my fave pallete the BH cosmetics special occasion palette. I will show this in the video coming. For the lips I used a combination of colors (which I will list below) to give me this beautiful ombre pink finish. But mostly, I am really grateful for all of you that continue to show me support, whether it be clicking on a post ..+1ing...commenting...no matter how little, you guys truly keep me going and I am soooo grateful. As always thanks for stopping by and may your Monday and the rest of your week be as bright as my weave....lol AB! What are some of your go to lippies this fall?